Runners get plenty of movement in the sagittal plane of movement (forward movement). Quads and hammies tend to be worked pretty well. However, if a runner finds himself stepping out of that forward plane of motion (maybe while trail running or maybe to make a sudden lateral movement to avoid a pothole or to dodge an automobile) then he may find that his muscles don't react as quickly or maybe not even at all causing him to fall and possibly become injured. Adding lateral movement exercises into your weekly fitness routine is a great way to bolster those stabilizer muscles and muscles responsible for side-to-side movement. 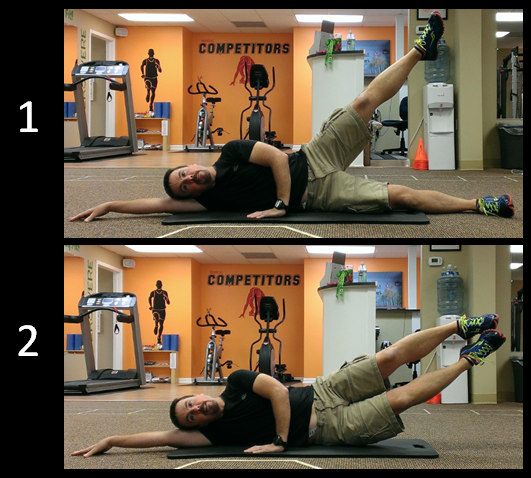 This week's exercise is great for increasing strength in your hip abductors and hip adductors. Improving strength in these muscles can often help prevent runner's knee and groin injuries. To complete the exercise, lie on your right side with your head resting on your extended right arm. Lift your left leg up, keeping the knee extended (Fig. 1). This movement will activate the left glute medius (hip abductor). While keeping the left leg in the air, raise the right leg up toward the left leg (Fig. 2). This movement will activate the adductor muscles along the inner thigh of your right leg. Then lower both legs to the floor. That's one rep. Do 10-12 reps on one side. Then flip over and repeat the exercise lying on your left side.